Birthdays and anniversaries require cake so we're having cake today for this little Blog's 4th Anniversary! When I realized this anniversary was coming up, I started thinking about cake. Surprisingly, I didn't have a queue of cakes I wanted to make sitting on the sidelines so I kept it simple and just asked myself: what kind of cake do I want to eat? And pistachio cake popped into my mind. I've been on a pistachio kick lately and, to me, they're kind of like pears in that I'll go for a while without eating them and forget how good they are until I eat them again. So pistachios it was! In the back of my mind, I was seeing this chocolate pistachio cake of Martha's that I always found alluring. I stuck with the torte idea (which I tend to think of as nut-based, European-style, cakes) but instead of making a chocolate-pistachio cake, I made it a pistachio cake with chocolate. I wanted the bright, nutty flavor of the pistachios to shine. I based the cake on a recipe from epicurious and added the chocolate elements. 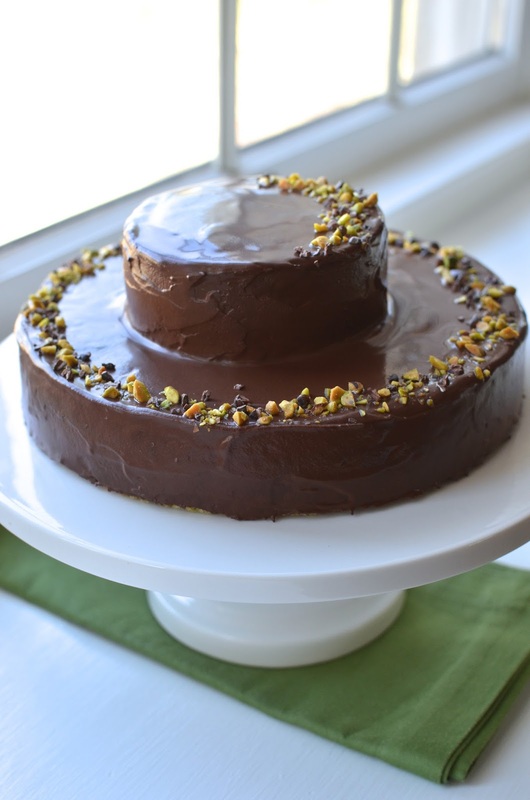 Pistachios and orange with chocolate is one of my favorite combinations so that's what we have. I didn't give this cake a lot of pre-thought before making it and wow, I was very pleasantly surprised by the cake I ended up with! It was totally scrumptious, really moist and full of nutty citrus flavor, capped off by that coating of chocolate ganache. I will be making this one again and again. 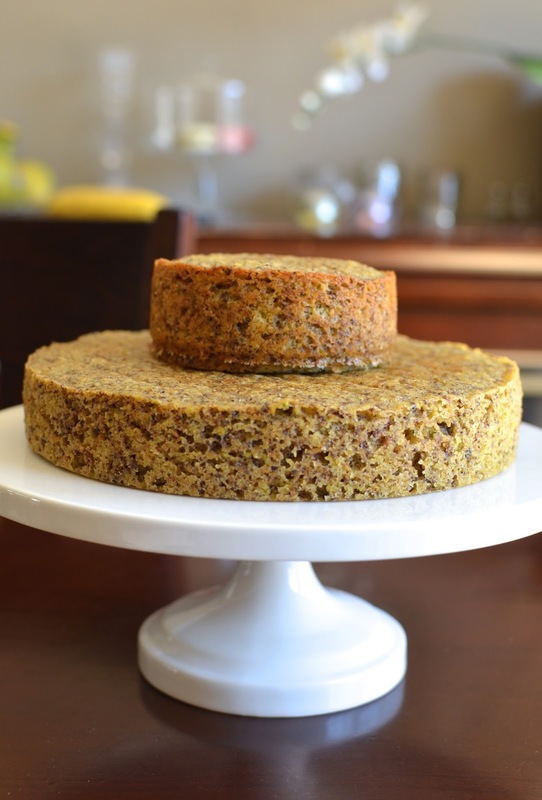 The cake is made with ground pistachios but since it's not propped up solely on ground nuts (there's flour in it, too), the texture is moist and dense but also stands firmly in traditional cake territory as well. I find cakes made entirely with ground nuts can be too rich and moist for my taste so this was a great balance. There's a lovely chewiness to it also that I adore. Orange zest works so well with pistachios and while I already have chocolate well represented in the coating, I couldn't resist adding another hint of chocolate in the cake itself. So I grated an ounce of dark chocolate and folded it into the batter at the last moment. You might not be able to detect the shaved chocolate within the cake but I'm comforted to know it's there. I attempted to make this a little more special by creating a two-tier cake, a 4-inch on top of an 8-inch base. As you can see, I swaddled the cake in chocolate ganache, which is like an irrepressible reflex for me. I am exploring my new interest in water ganache so it was made with just dark chocolate and water. I'd use a little less water next time for a thicker consistency but I'm so far very happy with the water ganache option. 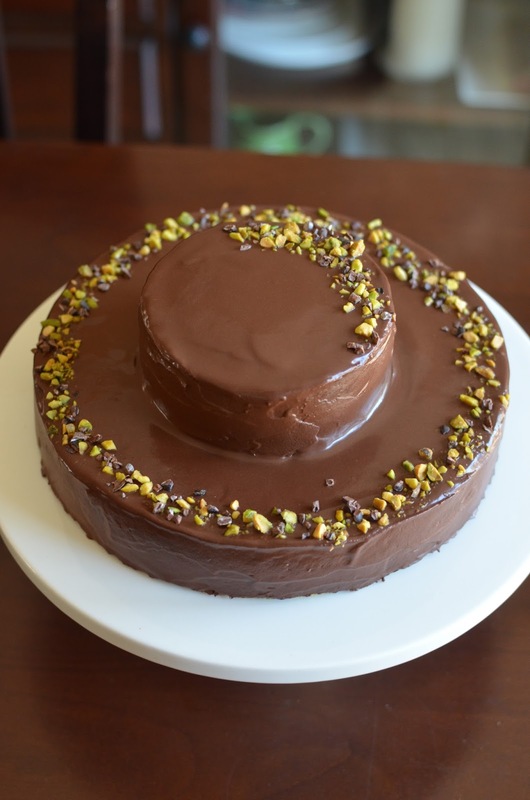 I topped the cake with a little decoration of chopped pistachios and cocoa nibs. I would say this cake is a good representation of the kind of cake I love to eat - a moist, flavorful cake featuring nuts and chocolate! I'm so glad I made cake to celebrating four years tapping away on this blog! When I first started here, I didn't know how long I'd keep at it, and I still don't. I'm almost surprised I'm still plugging away here but the truth is this continues to be a fun outlet for me and a motivation for learning. I love thinking, talking, reading, writing, cooking, and eating food and that hasn't changed. I've learned to be comfortable in this space and I enjoy the freedom to make and show what I want without being pinned down to anything. For a non-creative person like me, I really love the act of creating these pages - seeing these posts come to be with a recipe, some time in the kitchen, and then some words and a few pictures. There is a great sense of satisfaction in it that I'm very grateful for. Let's talk some more about this very tasty cake! It starts with 3/4 cup of toasted pistachios (I just buy and use dry toasted, unsalted ones for this recipe). Grind the nuts finely but not so much that it turns into a paste! This, along with a cup of all-purpose flour, provides the structure for the cake. I really like the balance of nuts with the flour; it makes for a nice texture of moist dense cake yet not overly wet. I divided the batter into an 8-inch cake pan and a 4-inch for the second tier. Yes, I was thinking wedding cake. You can simply bake the batter in a 9-inch cake pan. Some of the dark specks comes from 1 ounce of dark chocolate that I grated in the largest opening of a box grater. I folded that into the batter at the last minute, like I did with the banana-chocolate chiffon cake. I love the visual (not to mention taste) of little flecks of chocolate running through my cakes. Have you ever gone to press the "oven light" button on your oven but inadvertently turn off the timer instead? That happens to me too often (I'm going to blame it on a design flaw!) so I can only approximate that I baked the larger cake for about 30-35 minutes while the smaller was done about 5-7 earlier. About the water ganache...I'm only starting to figure out the ratios and I used 5 ounces of dark chocolate with 4 ounces (half a cup) of water for this cake. I've adjusted the recipe attached, reducing the amount of water, because I found mine a bit too loose even after chilling for a while. And needless to say, since there are only two ingredients here - and one being water - use a good-quality chocolate you love because that's the taste that comes through. Waiting for my ganache to thicken required more time than I expected so the cake took me longer to complete. Patience paid off though. I ended up slathering the first layer with ganache, chilling it for about 10 minutes, before applying a second layer. You can skip the two-step process if you start with a thicker ganache. I frosted the second, smaller layer, on a separate plate and then transferred it on to the base layer, using extra ganache to smooth out or patch up any major dents. Since my ganache was loose, I stored the cake in the fridge to allow it to set up (and it did very nicely!). I ended up keeping the cake in the fridge, cutting slices and allowing them to come to room temperature before serving. The ganache sets firm in the fridge (more so than you see here, where the cake was freshly coated and sliced) and the cake stayed delightfully moist while the ganache was firm yet soft, full of chocolate flavor, for a few days. It's funny but we removed the little top tier and froze it, like people do with the top layer of their wedding cake. I can promise you that we will not wait a year to eat it though! My husband and I have imminent plans for a date night, capped off with two forks digging into this delicious "anniversary" cake. Make cake: Preheat oven to 350 degrees, with a rack in the middle position. Prep an 8-inch round cake pan and a 4-inch round cake pan by spraying with baking spray, lining the bottoms with a round of parchment paper, and spraying the paper (alternatively, you could butter and flour the pans). Place pistachios into a food processor and pulse until finely ground, about 40 seconds (do not over-process or the pistachios could turn into a paste). Add flour, baking powder, and salt, and pulse briefly to combine. In a stand-mixer fitted with the paddle attachment, beat butter, sugar, and orange zest (I like to zest the orange right on top and rub it gently into the sugar) on medium-speed until light and fluffy, about 1 1/2 - 2 minutes. Add eggs, one at a time, beating well with each addition. On low-speed, add the pistachio and flour mixture in 2 batches alternating with the milk mixture in between. Mix until just combined. Fold in the grated chocolate with a large rubber spatula. Spread batter about 3/4 way full into the prepared 4-inch cake pan. Transfer the rest of the batter into the 8-inch pan, smoothing the top. (For a simple one-layer torte, you can bake the batter in a prepared 9-inch cake pan.) Place pans on a baking sheet and bake until a cake tester inserted into the center of the cakes comes out clean - about 30-40 minutes for the 8-inch cake and 5-10 less for the smaller. Remove cakes from the oven, let sit on a wire rack for about 10 minutes. Run a knife around the sides of the cake, remove the cakes, and let cool completely on a rack. Make ganache: Place chocolate in a heatproof bowl. Pour boiling water over top and let sit for about a minute. Then gently whisk the mixture until smooth. Let sit at room temperature, whisking occasionally, until it thickens enough to spread (you can speed the process up by placing it in the fridge but don't forget about it). Assemble cake: Place the 8-inch cake on top of a cake pedestal or serving platter. Tuck pieces of wax or parchment paper under the rim of the cake for easy cleanup. Spread ganache on top and down the sides of the cake. Likewise frost the smaller 4-inch cake on a smaller plate, then using a large spatula, carefully transfer it on top of the bigger base layer. Touch up the cake, as needed, with ganache. 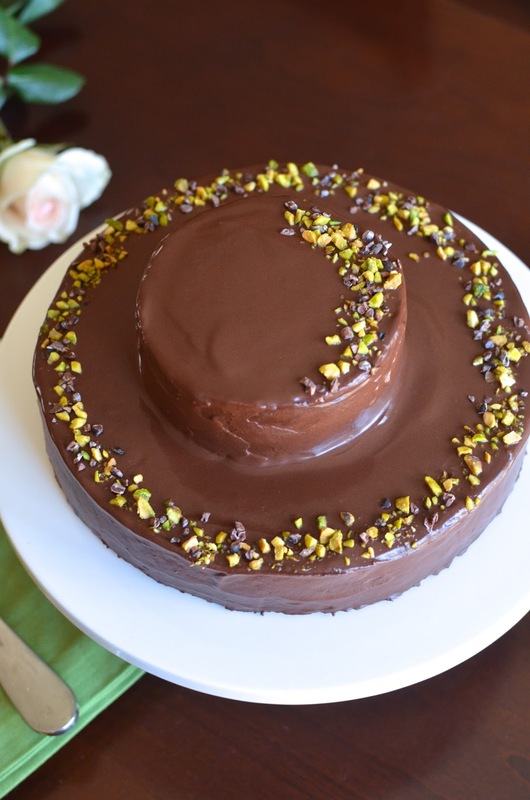 To decorate, sprinkle chopped pistachios and cocoa nibs around the sides of the cake. Remove the wax or parchment paper under the cake. Place cake in the refrigerator for about half an hour to set. I stored my cake in the fridge but let slices come to room temperature before serving. Cake should stay moist this way for about 3 days. Happy blog-iversary! This cake is perfect for the celebration. The texture looks wonderful and the color is fantastic. Of course the chocolate ganache seals the deal for me too. I look forward to many more wonderful years of recipes to share. Congratulations! Thank you! I wasn't sure the chocolate + water alone would work but it really does and I plan to use that often. What a gorgeous cake! I love pistachios and have a feeling the ganache makes them that much better!! The cake looks splendid and just the right one for the celebration! You are right to celebrate with a cake like this. OMG, just looking at the pictures made me hungry. Congratulations to your anniversary, keep writing and creating. Thank you! Thanks for the kind words. I'll grab any excuse to make, eat, and share cake! Aaaw yay! Happy happy blog anniversary my friend! Congrats on 4 years! You are the sweetest and so supportive of everyone and I always love coming here to see all your fun desserts you make with your son and elegant meals. Love this cake! It's absolutely gorgeous and the chocolate, orange, and pistachio combination are just perfect! I've never tried a water ganache, that sounds fantastic! Cheers and can't wait to see all the yumminess you make this year! What a joy to see this gorgeous cake on my browser Monica! Congratulations on 4 years of blogging Monica and long may it continue, I do so enjoy your posts, experiments and writing and can only hope to be such a diligent blogger as you. Wow - what a cake to celebrate!! It is perfectly baked, decorated and such great flavours. A real beauty for a celebration, great job!! haha - I have a feeling I would love to sit down and share cake with you, Consuelo. You are too busy though! : ) Thank you! This is just the perfect looking cake! Love the tiers! Happy 4th anniversary! Four years of blogging is a LOT of work and a LOT of chocolate! :) Congratulations, my friend, on your scrumptious collection of recipes, on your loyal community of followers( SO well deserved), and on your continuing enthusiasm! It was a lucky day for me when I stumbled upon one of your supportive and inquisitive comments....probably at Shannon's , a periodic table. Clicking through brought me here to playing with flour, where I have learned so many things and found so many recipes that are now favorites. Best of all, I found a blogging friend. :) Happy Blogiversary, Monica! p.s. The cake looks gorgeous! I am very intrigued by the water ganache!! haha- you made me laugh about the "LOT" of chocolate! So true - I can't think how much chocolate I consume a year and I'm honestly happy and thankful for it! : ) Thank YOU for all your kind words and encouragement (most of which I feel I don't deserve!). I feel lucky that we got to know each other a bit through this forum and I hope we'll continue to stay in touch. I honestly don't have 'followers' and wouldn't kid myself about it. I'm just super grateful that there are so many nice people out there who share my interest in food and who are willing to have a little conversation about it sometimes. Thanks again, Wendy! Thank you so much! I just love seeing a post come to life, you know? Maybe I just have too much time on my hands! Hope to see more of your posts and thanks for stopping by sometimes. Oh my gosh this is stunning! I'm so impressed by your tiers. What a way to celebrate! This is my attempt at 'wedding cake', Joanne. : ) The cake is firm enough to hold that little layer on top. Glad it worked out because I just thought I'd try it and see...that's how I seem to operate. Monica! Happy blogging anniversary!! I always love reading your posts :) So thank you for doing what you do too!! And I have to say, I love that you froze the top layer of this cake! That made me smile! And it does sound absolutely delicious - I'm the same way with pistachios - I love them but seem to get on kicks where I can't stop eating them and then others when I kind of forget about them! That little top layer is still in the freezer somehow! : ) We just got back from a little trip and I've been cooking and baking so we have to work through that before my husband and I dive into the cake. Isn't it funny about pistachios...and how funny we all often think alike! Thanks again! This cake looks absolutely amazing!!! Happy blog anniversary! Happy Blogiversary Monica! What a glorious cake to celebrate with! 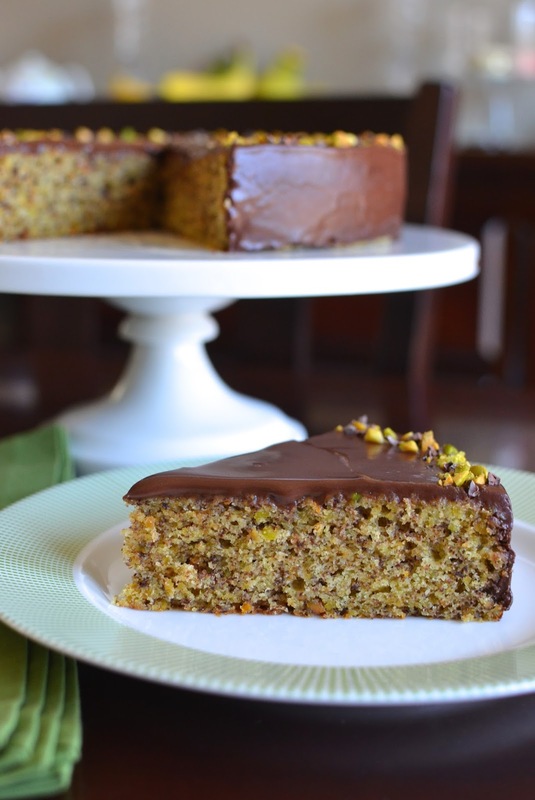 Just adore the idea of the pistachio cake and with a little orange zest and slathered with chocolate ganache. Oh my goodness that looks so amazing and your photos are just gorgeous to boot! You have really out done yourself on this post. Sharing!!! Congratulations on four years blogging! It's a real accomplishment. I'm sad when bloggers I love stop writing, but it's always great to "meet" new ones. Your cake looks amazing. You are so right...it's lovely to find all sorts of inspiration from new and old quarters. : ) Thanks, Beth. Happy happy Blog anniversary and many many more years of delicious recipes and posts! You have chosen such an amazing way to celebrate it. Everything about this cake is perfection..the flavours, the texture and the way it looks. Stunning! I feel sad about some blogs exiting too.It's actually a journey filled with challenges...at times it's hard to keep up. I am glad that you are around and I hope to see more and more.